Hunt the streets of Paris for the Woman in Red. This mysterious beauty is leading you on a chase through the streets to find hidden treasures. You'll pass through the sites of the city and collect some French icons in order to unlock her mystery and find your hidden fortune. Keep your eye on the Woman in Red. She's the key to unlocking this mystery, but she only appears on selected reels. Prizes are tripled when the Woman in Red appears in any winning combination. If you can spin two to five of the mysterious male friends, you'll get up to 1500 times your original line bet. The Arc de Triomphe can get you up to 1000 times your bet. Also watch out for Painter's Palettes and Croissants. These French icons will pay out generously. You can also trigger some bonus features if you follow the Woman in Red to the Eiffel Tower. See if you can solve this mystery and unlock the secrets of the Woman in Red and her riches. 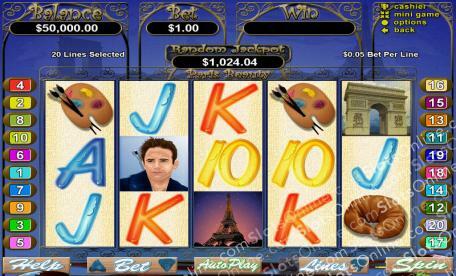 Two or more Eiffel Towers will muliply your total bet respectively. Three or more of these icons will trigger a bonus feature in which you will be awarded 12 free games. During these games, all prizes are doubled. 2, 3 and 4 Towers during the free games will trigger more free games. The Woman in Red will substitute for all other symbols except the scatters. She only appears on reels 1 and 5 and will triple all prizes when she appears in a winning combination.